Whether you’re a property developer who wants to generate awareness for a new building, or you’re a student-housing provider who needs to fill vacant rooms before the start of the academic year, the way you communicate with your target audience is essential to achieving your goals. The property industry is incredibly competitive, meaning that your target personas have the freedom to choose your competitors over you if you don’t grab their attention straight away. Writing is branding, and your tone of voice tells your audience what you are like as a brand. The way that you communicate has the ability to inspire trust in your product, to influence your reader, and to help you stand out in a saturated market. When you’re deciding what tone of voice you should use for your property business, the first place to begin is with your brand values. You need to consider what your product is, and who your target audience is made up of. Once you’ve established this, you can assess how your competitors communicate in relation to their values. What your product is. Although your product doesn’t dictate entirely who your target personas are, it does play a big role. You won’t communicate with students in the same way that you’d communicate with office managers. So the first step in choosing your tone of voice is to analyse your product and who would be interested in it. Who your target personas are. You will begin to establish this when you’re thinking about your product, and the rest comes down to your business objectives. For example, you might have already established that your target audience consists of students, but you then need to work out what type of students they are. Do they come from wealthy backgrounds, for example? Because this will influence how you communicate with them. Your competitors’ communications. Do your competitors target a similar audience, and do they do it well? Is there anything they do that works, or can you communicate with your audience in a different way that will work better? Once you’ve constructed a clear image of your target personas and how they like to be spoken to, you can begin to consider how you will communicate with them. Now that you know who you’re communicating with, you can establish how compatible they are with your brand’s existing personality. It will be this personality that earns the trust of your audience and expresses the benefits of your product, using language that they understand. Your communications should capture a side of your brand’s personality that your audience will want to see. This will help to create a well-rounded and genuine tone of voice that your audience will connect with, which you can then utilise in all of your digital communications. Once this is established, you should decide how your writing will reflect your personality. Are you going to use the formal language associated with professional services, or is your brand (and product) better suited to an informal tone of voice? If you’re a student-housing provider, for example, you can use a fun and engaging tone, making use of relevant colloquialisms that will appeal to your reader. People are hardwired to connect with stories, which makes brand storytelling an effective tool for property marketers. Communicating with your target audience in this way involves highlighting the emotional experience that is connected with your product, and your tone of voice has to help you to achieve that. For example, property developers who create homes for families can tell the story of wholesome family life, whereas student-housing providers would be better suited to expressing the good times that university offers. In order to tell an effective story, your language has to create a strong image that expresses the benefits of choosing your property, in a way that entertains and appeals to the emotions of the reader. 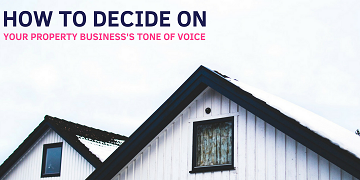 Getting your tone of voice right can help your property brand to stand out in an otherwise busy market. This involves understanding your target audience, injecting some personality into your writing, and using the right language to tell the right stories. To find out how to create a property marketing campaign, download our essential guide.